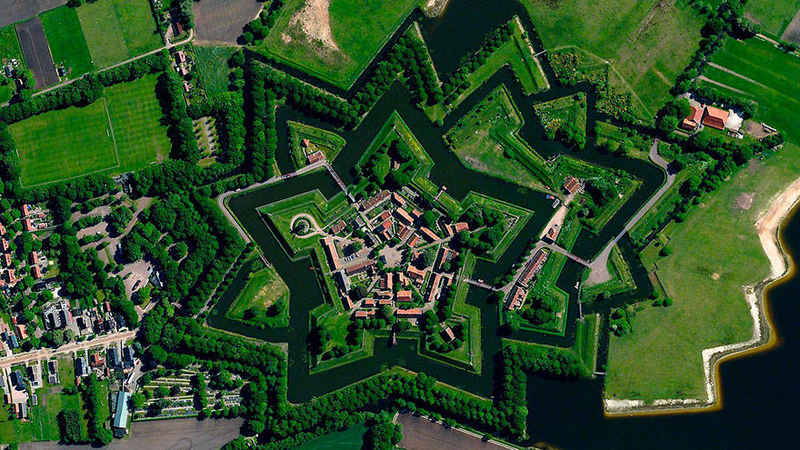 I think we can agree that we cannot effectively manage what we cannot see. This is particularly true with business process. If we all don’t see the same thing, we cannot begin to make things better. With today’s torrid business pace, many organizations make assumptions about how major business processes are run and that everyone understands the “true process.” This is rarely the case as evidenced by the poor record for successful systems installations, disappointing merger integrations, failed execution of customer programs, and slower than expected adoption of change initiatives. One of the problems is that there is not a common understanding of the current business process making it very difficult to determine required changes and enhancements. This is particularly true in merger integration cases where each company might use a different process language for doing the same activity. In these cases it’s critical that all parties use a common language of process activities to achieve true visual understanding, and a foundational base for collaboration. We believe that better “Process Visibility” can make a big difference. How did this happen? On a major retailer, I chose to display the entire sourcing process on one page, listing 55 Activities in 5 Phases. I was then able to then use this single display to make a case that 80% of process improvements could be accomplished by focusing on only 7 Activities. This led to a very successful organization-wide training effort to implement best practices in these 7 Activities. 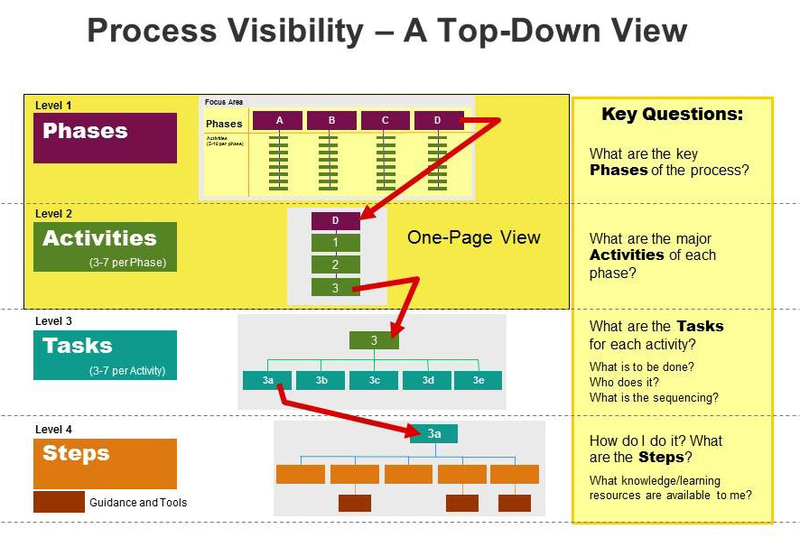 Process Visibility is a rigorous process “presentation methodology” that seeks to depict all of the key Phases and Activities of a Process on one page, using a simple verb/noun structure. Why is putting everything on one page important? The one page view simplifies, and makes visible, all of the key process Phases and Activities of any focused process discussion. This results in increased understanding across stakeholders due to using a “common language” of process to promote faster collaboration and problem solving. While this it is simple in concept, it does involve a deliberate and systematic analysis of the process at varying levels of detail, as called for in the methodology. The graphic below shows four levels of process definition: Phases, Activities, Tasks, and Steps. Each level is defined so as to create a visual presentation that is consistent among other elements, as defined. The first two levels, Phases and Activities, result in the one-page depiction of the process under review. Activities usually describe a major piece of work that typically produces a key deliverable that is important to the next Activity, or for the completion of a Phase. The completion of a Phase usually represents a generally recognized completion of all deliverables required to begin the next Phase. The determination of each of these elements is typically developed by having a small team, using the methodology, create an initial strawman process, and then have key stakeholders collaborate to confirm the levels of details and add to or edit the verb noun language used throughout the process. How is this different than Process Mapping? Most people are familiar with Process Mapping. The primary difference Process Visibility and Process Mapping is in its purpose. The goal of Process Mapping is to create an accurate and complete depiction of a process at its lowest level of detail to include all key stakeholders tasks and steps, and also to include the presentation of relevant systems and data elements. The goal of Process Visibility is the presentation of the entire end-to-end process in sufficient detail on one page to facilitate an accelerated understanding and better collaboration among executives and managers. Think of Process Visibility as a high level “presentation layer” of process that lies between articulation of strategy and detail execution and management of the process. It’s important to note that the Process Visibility presentation layer must be technically consistent with the supporting tasks and steps typically found in process mapping. Think of the experience of today’s GPS applications that allow you to look at a city at a high level, and then zoom in to each street and home/business. As in a GPS application, Process Visibility is designed to maintain the integrity of process language at any level of zoom….Phase/Activity to Task/Step level. Finally, the Process Visibility focus is not so much about detailed business process reengineering or Lean /Six Sigma level Process Mapping, as it is about creating the high-level visibility necessary to set context for common language discussion, cross functional problem-solving, training and on boarding, and companywide innovation. 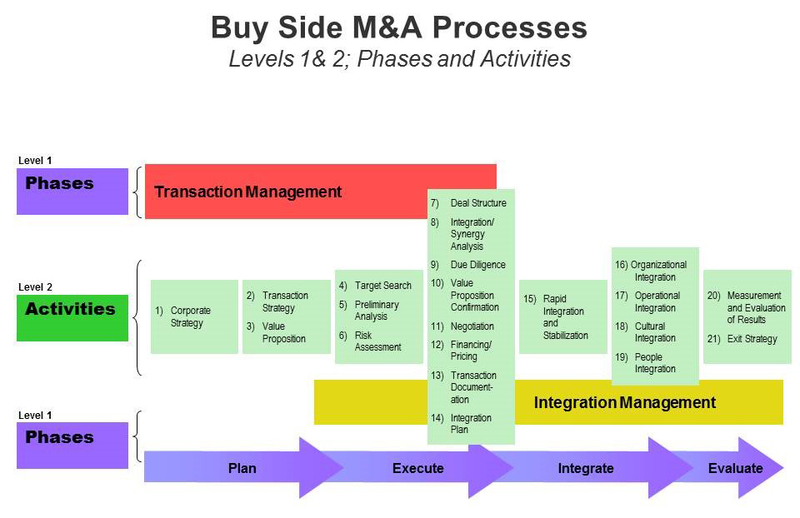 The following Process Visibility depiction is a composite map developed from a series of process engagements with professional services firms providing Buy-Side M&A services. In this case, the map depicts a total of 21 key activities performed during the lifecycle of the M&A process. Note that each activity would generally produce an important deliverable necessary for the completion of the entire process. Also, the execution of these specific activities were designed to ensure that the projected benefits of a merger were achieved through a very deliberate and systematic merger integration process. The top-level depiction of these processes helped the teams work with clients to execute the key activities across the entire process. Each Activity had supporting Tasks and Steps identified, project plans, example deliverables, and links to experts in their firms that could help them with each of the identified activities. In addition, this process-based organization helped create the related knowledge management systems that delivered the relevant reusable tools, templates, and examples to make the process more efficient. As mentioned earlier, the following is an example of the Process Visibility depiction of the lateral hire process, which is critical to support the growth of the law firm. 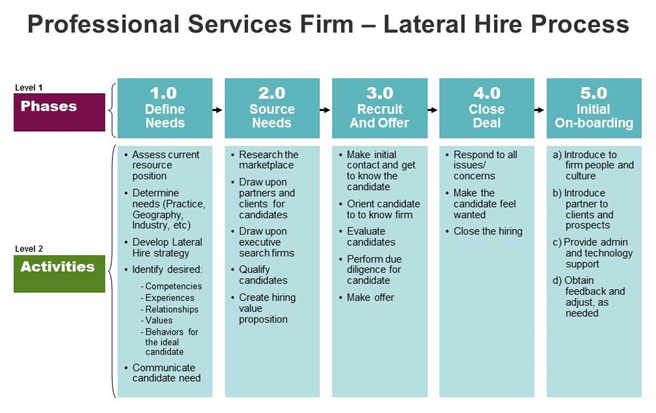 Through the lateral hire process, firms are able to recruit very experienced partners, attorneys, associates, and even their clients as part of an overall law firm growth strategy. To illustrate the benefits of this type of depiction, we conducted a meeting with the CEO, and later with leadership partners of a major law firm. For each of these meetings, we used this one slide to review the strengths and weaknesses of each of the companies lateral hire activities depicted. This allowed the partners to use the common language of this process to focus their attention on specific activities, perceived deficiencies, suggested changes, and allowed us to plan a course of action for improvement of selected activities. As with most client engagements, we found that there were always 3 to 5 key activities of this type of display that needed major attention and improvement. This allowed us to develop specific work plans and training programs. We believe that the implementation of this Process Visibility approach, to create this one-page process depiction, is a quick way to mobilize a team to see and understand the process, to use a common language of collaboration, and to provide a sound foundation for action on priority problems and group solutions This is a proven methodology, but it requires a deliberate and systematic effort in identifying Phases, Activities, Tasks and Steps for a targeted important process.